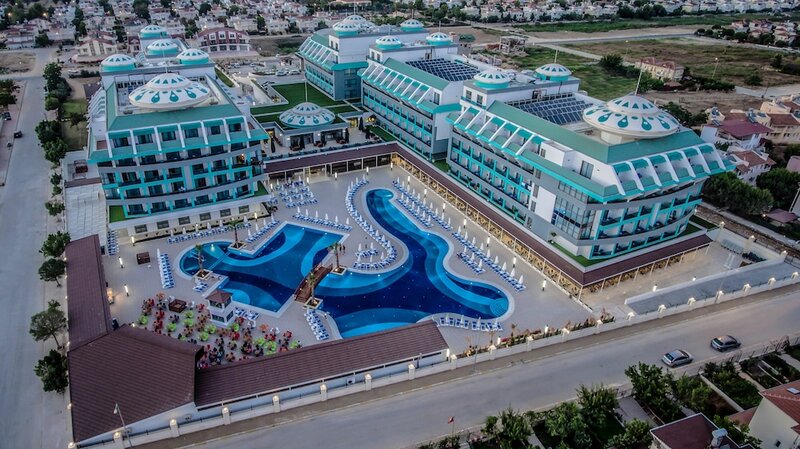 Located in Belek, Sensitive Premium Resort & Spa - All Inclusive is within a 15-minute drive of Troy Aqua and Dolphinarium and Belek Mosque. This all-inclusive property is 10 mi (16 km) from The Land of Legends and 9.5 mi (15.2 km) from Kaya Eagles Golf Club. Make yourself at home in one of the 402 air-conditioned rooms featuring free minibar items and LCD televisions. Rooms have private balconies. Complimentary wireless Internet access keeps you connected, and satellite programming is available for your entertainment. Private bathrooms with showers feature complimentary toiletries and hair dryers. Relax at the full-service spa, where you can enjoy massages, body treatments, and facials. After dipping into one of the 2 outdoor swimming pools, you can spend some time at the private beach. Additional features at this property include complimentary wireless Internet access, concierge services, and babysitting/childcare (surcharge). The complimentary beach shuttle makes getting to the surf and sand a breeze. Grab a bite at Vira, one of the property's 4 restaurants, or stay in and take advantage of the 24-hour room service. Snacks are also available at the coffee shop/café. Wrap up your day with a drink at the bar/lounge, the beach bar, or the poolside bar.